In 1982 a Binghamton singing group sensation, The Binghamton Crosbys, took to the stage for the first time selling out their very first show. Now celebrating their 35th Anniversary, they’ve been entertaining guests and winning competitions for years with their remarkable a cappella sound. You can always catch them performing throughout the area, but these singers have also performed at universities in the Northeast, at primary and secondary schools across the state, and on the incredible stages of Carnegie Hall, the Lincoln Center and even the Beacon Theater on Broadway. 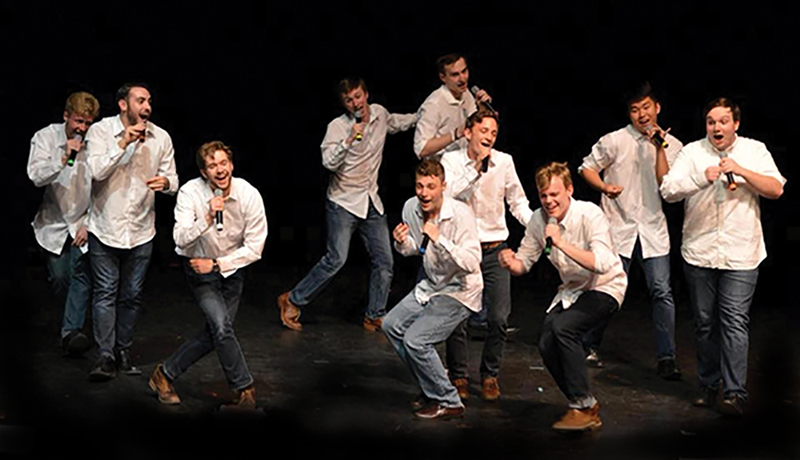 To their list of credits they’ve made the finals of the ICCA (International Championship of Collegiate A Cappella) competition four times, one of the highest totals among a cappella groups nationwide while taking home honors such as Best Album, Best Soloist, Best Arrangement and Best Choreography. And in 2003 they won the competition !!! If you’ve seen Pitch Perfect, it’s the real-life version of the competition that was depicted in the movie. These guys are really great performers, but they’ll tell you they’re just regular college students who like to sing and have fun. Typically each singer is only in the group for 4 years as you have to be enrolled at SUNY Binghamton to be a member. If you want to join their ranks, you’re in luck, they hold auditions every semester. And whether you want to be on stage or in the audience, make sure you go see them and congratulate them on an amazing 35 years!